After the fur filled car, we thought we'd seen the worst of automotive personalization. A car covered with animal bits is not only a PETA nightmare, every version we'd seen involved slapdash construction. And then we saw this Citroen Saxo. 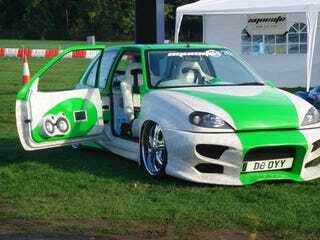 Ignore the body kit and the two-door suicide doors. Ignore the rims, paint, hydraulics. Ignore, if you can, the speakers and entertainment system. Set these trivial observations aside and take time to realize this little euro hatchback is covered in snakeskin. Seriously. Actual snakeskin that has been sewn into the body panels. According to Car Styling Tips, snakeskin doesn't shrink or crack like leather, and is therefore ideal for this kind of conversion. We want to hate it so much but at this point, we're still in awe of the craftsmanship that went into making this a functional vehicle.